Alternate Title: From pigeon house to dream home! Yes, seriously, our home was once filled with pigeons and all the nastiness that comes along with them. It was located in a small town about 15 miles from our farm, on a main corner. It was an eyesore that many of the locals had been lobbying to have torn down, or at least closed up so the pigeons would move on. But my husband saw a diamond in the rough...I must admit, I knew it could be beautiful, but I wasn't sure we needed to be taking on yet another responsibility. You see, we were expecting twins and we had three very young children already! We lived in a tiny 900 square foot house with two bedrooms. It was a beautiful little home, with polished hardwood floors and I had worked hard before we were married to hang wallpaper while Duane remodeled the bathroom and kitchen. But we had outgrown our little home. Before the twins arrived, we needed more space. We priced a new home. We priced adding on to our current house. And we talked about renovating an old home. But when we saw the spray painted numbers on the side of The Pigeon House "This House 4 Sale $8,000" we knew it was a sign...a sign that we couldn't ignore! Of course, I think Duane saw a challenge--a sound structure that we could use to create a sturdy house. 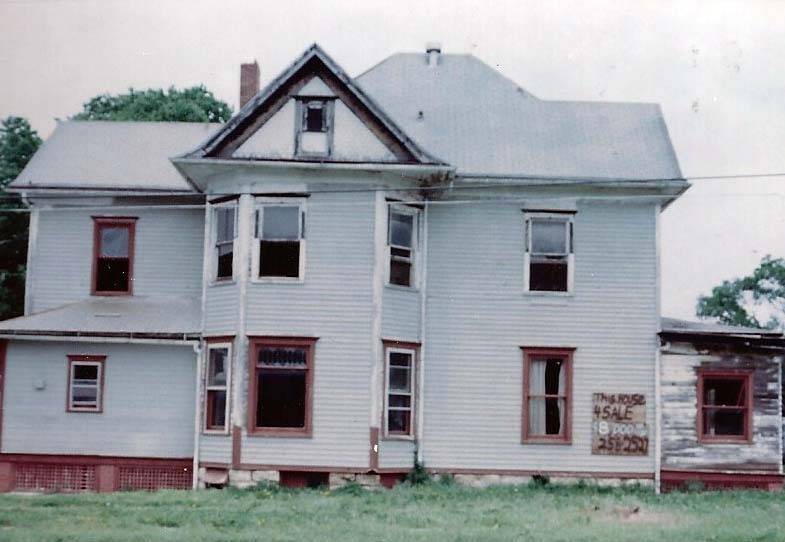 I saw a lot of work and money, but I also started dreaming about making a home out of this 3-story antique house with a history. I think the romanticism of it all won me over--but it took a long time! 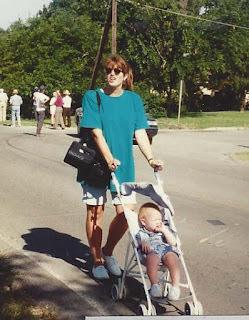 By the time we moved the house on July 11, 1995, I was due to deliver twins around November 30 and we knew I would have a lengthy bed-rest as I had premature labor with two previous babies. In July I was about 4 months pregnant, but looked more like 6-months along. I pushed Baby Trent (who was 13 months old) in a stroller along the street as they prepared the house for the move. Notice the huge video camera over my shoulder!! Moving the house was an organizational nightmare--there were three electric companies to deal with along the way. We had to pass under a main transmission line that couldn't be moved, so we had to cut the peak off the house and replace it once on the site. Every electrical line in the small town and along the highway to our new house site had to be either raised with poles or cut briefly. A crew from the local electric company led us along the highway raising or cutting the lines, and another followed replacing them again. 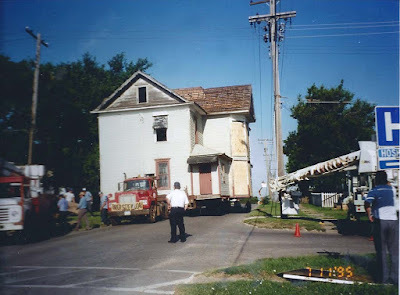 In addition, the house was too wide for the two-lane highway, so we had to detour traffic and the road signs all had to be removed and then replaced after the house passed by. 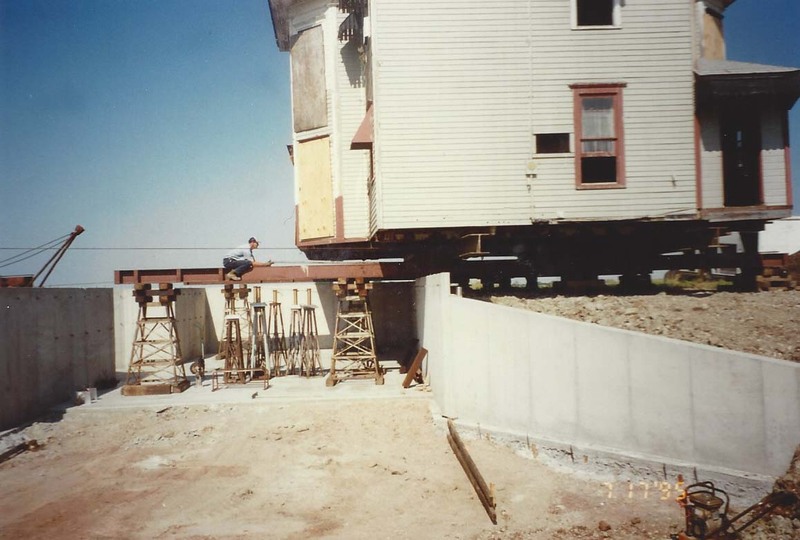 The house was originally too heavy to move on the road and over bridges, so we had to totally gut the house on the site. We tore out plaster and lathe and took it down to the wood--we wanted to replace the plumbing and electricity, as well as the insulation and flooring anyway! 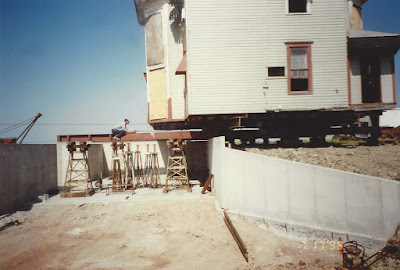 Once set on the site, the foundation was waiting and the last job of the move crew was to scoot it over onto the foundation/garage and then remove the huge I-beams it rested on during the move. This was completed in good shape and the crew was finished. Then our work began again. 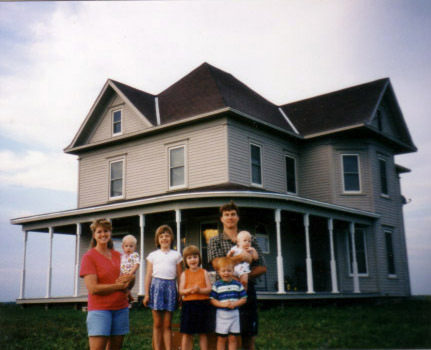 For 5 months, Duane and a crew of friends and neighbors worked at nights and all weekend to clean, renovate, and create our dream home before we moved in December 10, 1995. It is hard to believe that 20 years ago, we were barely beginning our life together and creating our beloved home. Today, the kids are nearly all grown and come home for occasional vacations or even a summer between college semesters. We have reached a totally new chapter of our lives, and there is still things to do for our home. The trees are finally growing in the yard, the house now has beautiful vinyl siding protecting it, and I have painted and repainted each room many times in 20 years. This house has lots of history--and much of it before we moved it to our ranch. Twenty years often seemed to crawl by, but looking back, the time flew! So Happy 20th Anniversary, Home Sweet Home! Aww, what a great story. And such a beautiful house! Thanks Lisa! We are pretty proud of it as we did so much work ourselves! Wow! It's like reading "This Old House" with my Saturday morning coffee. What an interesting story! Oh I love that show! Glad you enjoyed my story! Awwwww, thanks for saying that. We are pretty proud of all our work, and I love our big old house! I love the old photos, especially of the house traveling over the bridge. What a huge (literally!) undertaking! Thanks for sharing the story. I love that picture, too! It still amazes me that we literally drove our house down the road!!! The old farm house I grew up in was a true beauty it changed hands and now the owners grandchildren own ir and have let it go down to being shameful. The farm is 360 acres mostly useable land, it had some timber on it, they sold all of it, sold the mineral rights. The barn was really bit with a full loft. 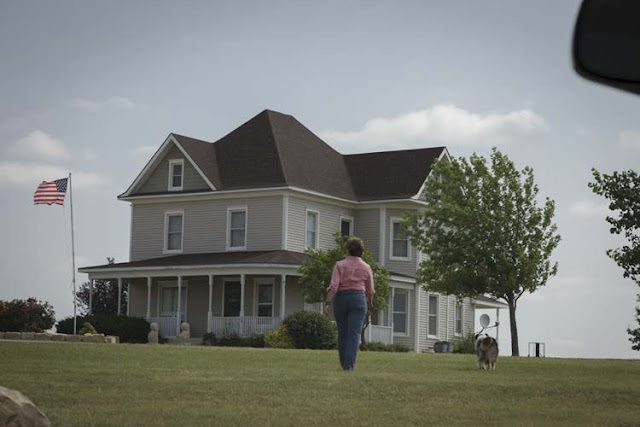 The house would be a perfect one to be restore It has a winding stair case that is solid cherry, lots of wood work, 13 ft ceilings and stands on a hill with the barn across the road. It is in southern Ohio. I would love to see someone buy it and restore it. Yours is really a Show place and looks like a great place to raise a family. Thanks, Ellie! We love this house and all its character!! Southern Ohio has some beautiful old brick houses. My grandparents have an old brick house in Ohio.